US network History hasn’t produced many scripted dramas as yet –Vikings, Knightfall and Six– is now joined by Project Blue Book. Inspired by Dr.J . Allen Hynek’s investigations for the US Air Force into the existence of UFOs, it centres around the military studies of all things flying saucers in the 1950s and ’60s. Think strange lights in the sky, Roswell, the Cold War, conspiracy theories and dark, smoky rooms. This is period X-Files which is both a good and a bad thing. Quite how this fits the SBS Charter is a bit of a mystery in itself, given it is produced as broadly-appealing American entertainment. Aiden Gillen, best known as “Little Finger” from Game of Thrones, plays University astronomy professor Dr. Hynek, recruited by an Air Force General (Neal McDonough) to investigate strange phenomena happening around Fargo, North Dakota. Paired with the handsome but cynical Captain Michael Quinn (Michael Malarkey), initially, Hynek is reluctant. “You want me to investigate flying saucers?” he asks. “This is a chance to show the world the truth,” says Capt. Quinn. With that our two heroes are united by science, so it would seem, and proceed to interview a shellshocked pilot whose plane was chased by a strange light with tell-tale scar marks. As Dr. Hynek begins to piece together an inexplicable scenario, Captain Quinn takes the sceptic view (paging Scully, anyone?) to defend Air Force authority and control, during an era of national fear. There are even shadowy figures on the side to point Hynek towards truth over conspiracies. Elsewhere, our General keeps his foot on the throat of his underling to ensure they get the outcome they want, which sorta begs the question: why recruit the professor in the first place? There’s an underwritten sub-plot with Hynek’s wife Mimi (Laura Mennell) in period retail scenes and their son discovering the joys of “duck and cover” drills. I get the feeling we are merging a lot of cold war / and Roswell era cliches, but I did enjoy the footage of The Day The Earth Stood Still. I can’t explain one plane crash scene where everyone survives and lives to see another day…. Gillen is engaging as the not-Agent-Mulder role and Michael Malarkey is nearly as easy on the eye as Dana Scully. But while the script by David O’Leary wastes no time in getting to its broadly-appealing action, the problem is largely that we’ve seen all this before. In this sense Project Blue Book begins as a bit of a missed opportunity. Sure it’s not lightly entertaining, but fingers crossed further episodes can bring a bit more originality to the table. The key to that actually lies in the dynamic between the two leads, not in little green men and flashes in the sky. 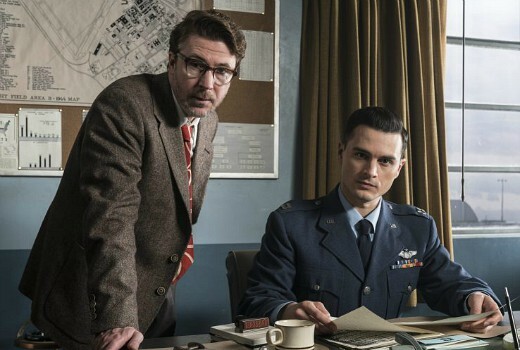 Project Blue Book double airs 8:30pm Thursday March 28 on SBS. I have no issue with the SBS having Project Blue Book, as it fits into their new look format, but there are 12 episodes and all have been broadcast in the USA so why the delayed release with (to date) just two episodes available, I’m sure some viewers would love to binge watch this show though you would need to ignore the aggravating SBS promos badly cut into the stream, you cant call it revenue advertising so why do it. Project Blue Book is well made but is obviously looking at an often used sci-fi genre that is likely of limited interest to some Gen Y & Z’s, the 50’s-60’s era of ‘flying saucers’ nuclear Armageddon and America’s scientific war in space with the Soviets. Does sound very similar to the X-Files but I love the subject matter so prepared to go into it with an open mind. Really looking forward to it. I’m actually really glad SBS have it and not 7, 9 or 10. Even though SBS will have ads they won’t be any where near as annoying with the storyline interrupting and frequency of the others. I really don’t know how this got a second season. It is no X Files, that’s for sure.